Visual Studio Team Services recently got custom states for work items. 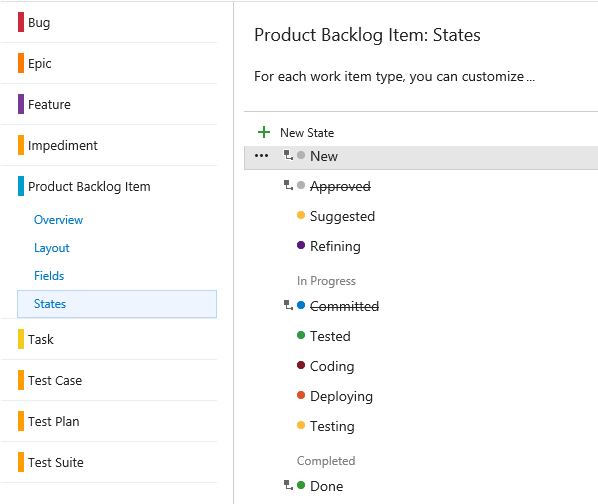 The simplest way to use this new feature is to create a custom state for each column on your Kanban board (previously, tasks had to be “Committed” all the way through the board). This feature makes it even easier to set up custom alerts based on a card hitting a column on the board. For example, perhaps your product owner wants a poke every time a card moves from “Testing” into “Tested” states. You can now create a Work Item alert, with a filter for when the state “Changes To” the custom state “Tested” (or whatever custom states you have set up). Each time a work item moves across, an email summarising the change will be sent to the users or groups you have selected.